I learnt this sponge dosa recipe from my neighbor.Whenever I run short of idli rice / Puzhungal arisi or urad dal , I make this sponge dosa without urad dal. 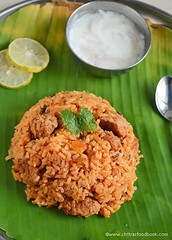 The ingredients and the method are a bit different from the usual poha dosa aval dosai. Usually sponge dosa batter is made using buttermilk and no fermentation is needed. You may also use cooked rice and prepare. But I ferment the batter at least for 8 hours.So you can prepare this dosa only by the next day. Try this soft sponge dosa recipe , Iam sure u will like it. 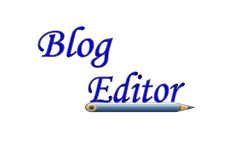 Salt & water – As needed. Wash and soak the rice , poha and methi seeds together for 2 hrs. Grind it to make a smooth batter by adding salt & water. Keep the batter for 8 – 10 hrs to ferment. The next day , add baking soda if you are using and mix the batter well. Rest for 10 minutes and make dosas. U all know , this dosa is small in size .So do not spread the batter on the tawa. Make it a small circle. Apply oil around the dosa if desired. Then cover cook in medium flame and don’t flip the dosa. 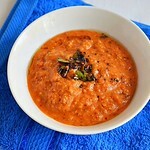 Serve hot with Coconut or Tomato chutney !! 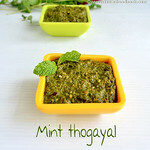 I served with tomato–mint chutney .. NOTE : Addition of cooking soda is optional.But it helps to make the dosa more porous and soft. 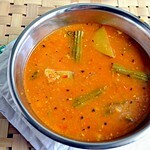 If you add cookings soda, rest the batter for 10 minutes before making the dosa. Do not forget. 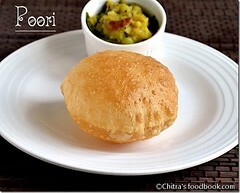 For variations, you can soak 2 tbsp urad dal along with poha and grind the batter. Technorati Tags: poha dosa,soft dosa,sponge dosa recipe,sponge dosa,aval dosai,super soft dosa,sponge dosa -fermentation method,breakfast recipes. I've soaked for masala dosa today had I seen this earlier I'd have tried it nevertheless...I'll make it sometime very soon, am Bookmaring it! Dosa looks so spongy and yummy!!! This is similar to the mushti dosa omly that there we use a bit of urad dhal.I loved the colour of the chutney. Is the recipe already up? dosa looks delicious...new to me...must try this..thx for posting! Wonderful dosa...they indeed looks so spongy. Really tempting. 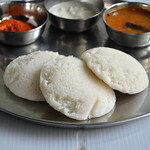 Hi Chitra.In the place where I live,I don't get idli rice so this seems to be the best idea for dosa!!! The dosa and chutney combo is so tempting! Very spongy and soft dosa Chitra..yumm! The porous white dosa is tempting! poha dosa without buttermilk! 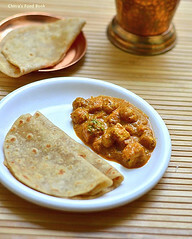 !, great one.., let me try making them..
Dosa looks spongy and yummy. Thanks a lot frnds for ur sweet comments. @ lataraja , thanks.Will post the chutney in my next post. Nice spongy dosa....a change from the usual ones. looks really delicious and yum! Very soft dosa. Love it very much. 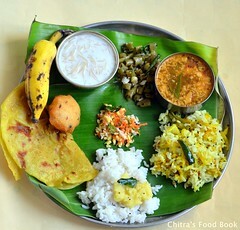 Hi Chitra, I did not know that sponge dosa can be made without urad dal. 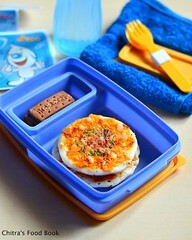 I am bookmarking this and trying it very soon! looks very soft..will try sometime. I love the chutney as well. Never heared of this kind of dosa and sure your recipe will help me in trying out this and lead to a geat challenge.These sound fabulous and will save the recipe. Thanks for the post. Looks yummy.got to do.we in bengaluru say,set dosa.soft,as u said sponge dosa. is this dosa and davangiri dosa are same?